Arnold Warren was born on the 2nd April 1875 he was the youngest son of John and Mary Warren and he had six brothers and a sister, Edward was the oldest then Charles H, Mary J Warren, Frank, William, George Keaveney and Albert. His father was a builder and as well as building Warren House on Wright Street, he and his sons built many of the houses in Codnor. 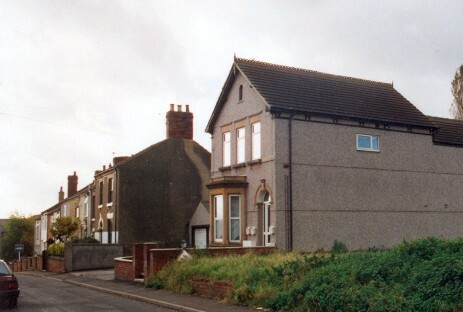 Fig.1 Warren House on Wright street. Built by Arnolds father John Warren, now transformed into apartments. Fig.2 Its not uncommon to find evidence of John Warren and sons building activities around Codnor. When Charles Warren finished building a house he would sign it like an Artist would a painting. 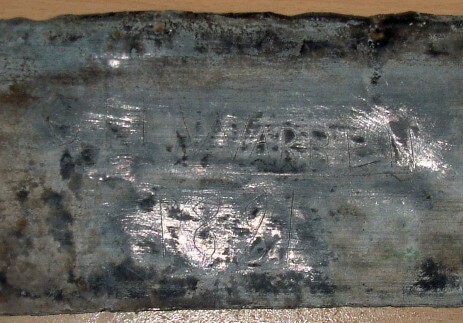 This is a piece of Lead flashing taken from a chimney off a house on Jessop Street. It is signed C.H.Warren 1881. 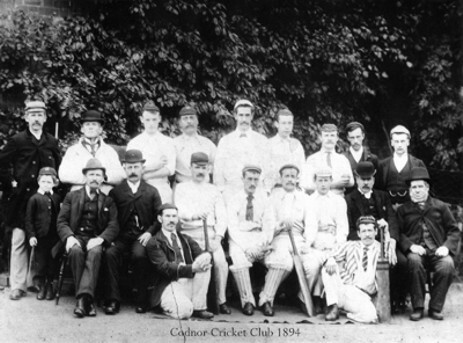 Fig.3 Codnor United Cricket Club, Alliance Team, Winners of the Gold Medals 1894. Back Row Left to Right: T.Searson, W Bostock (umpire) A.Warren, L.Fowkes, A.F.Pine (Captain), A.F.Fowkes, J.Taylor, E.Hanlon, H.Thorpe. Front Row Left to Right: J.Bailey (junior), C.Watson, J.Tomlinson, G.Langton, W.White, G.Darrington, R.Ratcliffe, G.Thorpe, H.Ratcliffe, T.Walker, J.Bailey (sen) Treasurer. Arnold wasnt the only cricketer from Codnor to play for Derbyshire, he was joined in 1902 by Noah Buxton who played Severn matches for the county. However his career ended abruptly in 1911 when he delivered three overs at the Oval and was then taken off for "Cobbing". (This is a term used when the ball is thrown rather than bowled). Arnold was also a keen footballer, In the 19th and early 20th century the cricket season lasted from April until September and the football season from October until March. Derby county originally shared the same facilities as Derbyshire Cricket Club at the county ground on the old racecourse until 1895. Arnold was able to play a season of football for Derby County in 1901-1902. But his cricketing record is what he will be remembered for. 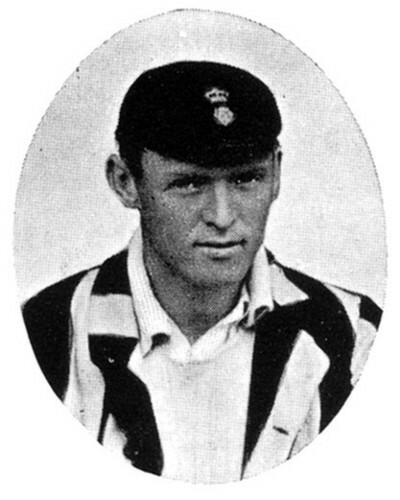 Arnold was at his peak in 1904 he became the first Derbyshire bowler to take 100 wickets in County Championship matches, he went on to take a total of 939 wickets in his first class cricket career. His partnership with Billy Bestwick (from Heanor) was to become the spearhead of the Derbyshire team. Both Warren and Bestwick were key players in what is considered to be Derbyshire's Greatest match against Essex in July 1904. Derbyshire making a late comeback to eventually win by nine wickets. In 1905 he was chosen by the England selectors to play in the third test match against Australia at Headingley in Leeds. Arnold put in a solid performance dismissing the cream of the Australian batting including the prized wicket of Victor Trumper in both innings. The match ended in a draw, see scorecard at bottom of page. 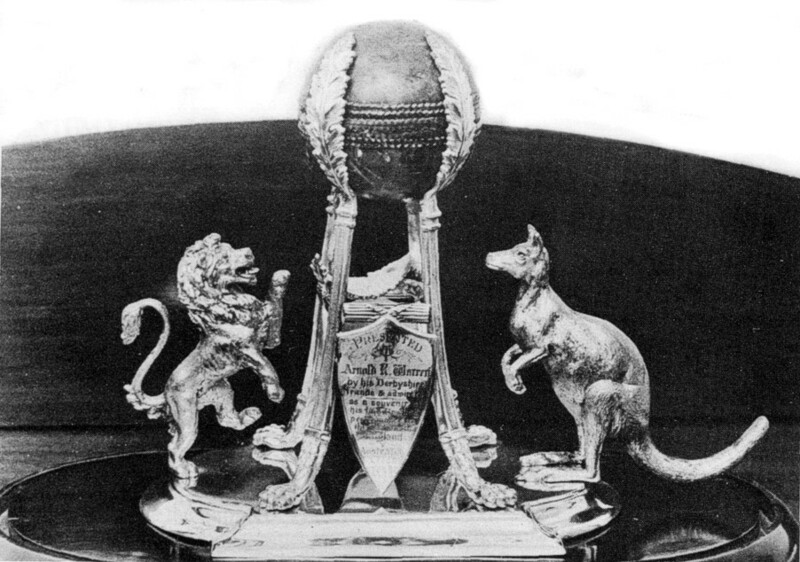 Fig.4 An impressive silver trophy presented to Arnold Warren. The ball, which Arnold used in the game, is mounted between the English Lion and the Australian Kangaroo. The plate is inscribed "Presented to Arnold Warren by his Derbyshire Friends and admirers as a souvenir of his bowling performance in the Test Match, England v Australia, at Leeds in 1905"
During Derbyshire’s match against Warwickshire at Blackwell Colliery Cricket ground in 1910, which was to end in a draw, Arnold shared a nine wicket partnership of 283 runs with the Captain, John Chapman. Arnold scoring 123 runs and Chapman 160. This was a world record for first class cricket and has never been beaten. There is a plaque commemorating this event in Blackwell community centre. However by 1913 Arnold's career was in decline, his "work hard, play hard" reputation being blamed for his poor performances. He had always enjoyed a few drinks during the interval; in fact during Derbyshire’s match with Leicestershire the previous year, Arnold had downed several Whiskies in the refreshment tent. He came out in the second half like a man possessed dismissing the Leicestershire batters in quick succession until they were all out for 97 with Derbyshire taking the win. But it also had a detrimental affect on his game. His inconsistencies on the field and waywardness off the field including brushes with the law and a spell of destitution together with his age of 38 all contributed to him being dropped from the side. 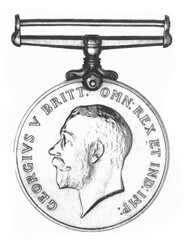 At the outbreak of the war many young men in Codnor joined the forces, however by 1915 Arnold was 40 years old and not eligible for active service. He eventually managed to enlist on 19th October 1915 by lying about his date of birth, he knocked two years of his age, giving a birth year as 1877. 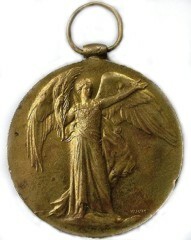 He joined the Royal Garrison Artillery but was seriously wounded by a shell in France in 1917. His medical records show he suffered fractures to his neck, spine and right scapula, and spent 136 days recovering in 2nd Western General Hospital, Manchester. He was eventually discharged after the war as Lance Bombardier on the 22nd February 1919. He was never able to return to his former cricketing glory, he complained of pain in his shoulder throughout the nineteen twenties and he received a disability pension from the army. In the book "My Village", Joseph Millot Severn indicates that Arnold's sister, Mary Jane Warren died of TB. I am advised the year of her death was 1881. The 1901 census shows Arnold living with his parents on Wright street together with his brother Albert and his wife, Lydia and their nine month old son. Arnold later married Ann Ellen Cater in 1902 at Christ church, Ironville and they had a son, John Martin K Warren in 1906, however his wife Ann died later the same year. The 1911 census records Arnold as a widower and still living on Wright street with his parents and son Martin. Although Arnold was unable to play cricket competitively he did continue as an umpire for first class cricket throughout the 1920s and early 30s. He also worked at Ormonde Colliery and still did a bit of bricklaying until he retired in 1945. After this he umpired cricket matches in the Codnor district and was Hon. Secretary of Codnor Miners Welfare Cricket Club. Arnold Warren died in September 1951 at a house on Hollywell avenue, were he was living temporarily because of an illness and was buried at Crosshill Cemetery. Among the mourners were Mr Taylor and Dennis Smith. who represented Derbyshire. In 1976 his son Martin was recorded as living in Australia. Key c = caught out by.. b = bowled out by..
and www.rootschat.com for their assistance in locating military and Census information for this article. Test match scorecard information transcribed from the following sources.